Your book and magazine assets provide a continuous, systematic narrative of past events that date back to the formation of your institution. The preservation of this narrative is of great value, because it links all the past, present and future members in one family with a common mission. What asset is more important than this repository of history, happenings and thoughts? 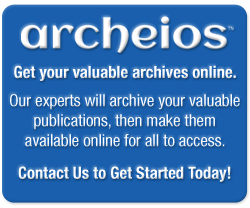 Archeios can economically create and distribute a complete digital facsimile of your historic assets without the worry of loss due to fire, water damage, and other natural disasters. Questions about who was to blame for not having a backup would be secondary to the grief and remorse that would occur with such an irreplaceable loss. We will help you move forward with the confidence and assurance that your narrative assets are safely preserved, also providing you a method to do the same for current and future publications.